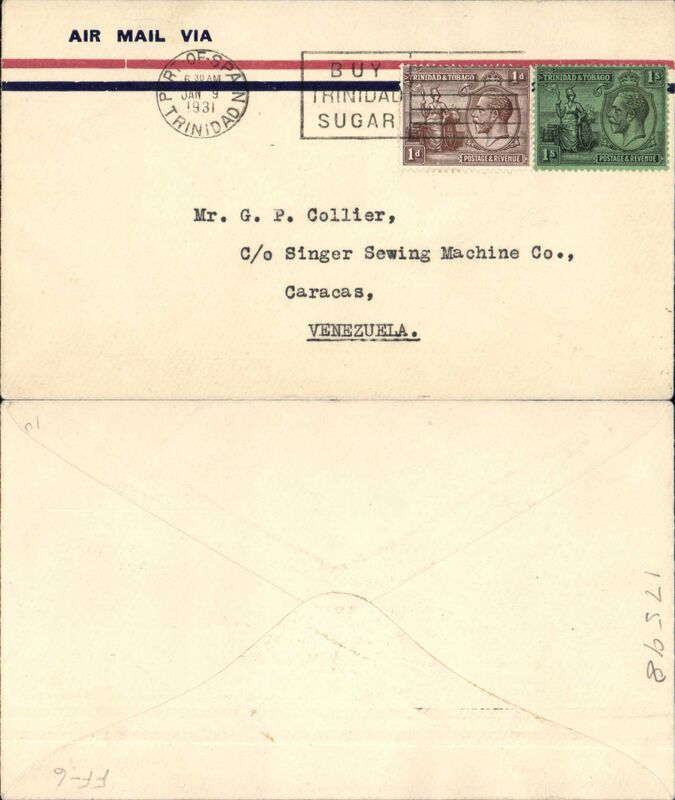 F/F FAM 6, Port of Spain to Miami, registered (label) cover franked 2/-, 1929 red on cream etiquette rated rare (Mair), b/s. 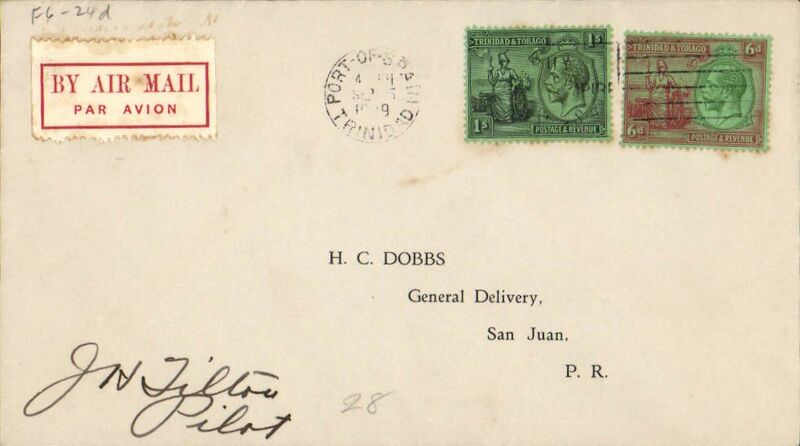 F/F FAM 6, Port of Spain to Cristobal, bs 2/10, franked 1/6d, 1929 red on cream etiquette rated rare (Mair),Pan Am, Image. 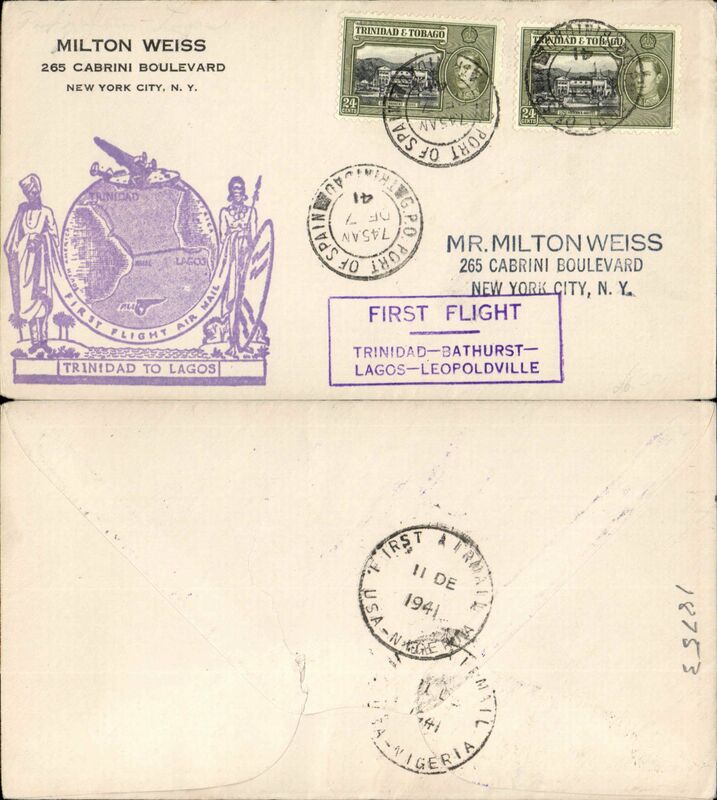 NYRBA, first regular through service Buenos Aires to Miami, Port of Spain to Haiti, bs 25/2, and on to Santo Domingo 12/3, plain cover franked 1/2d, blue white airmail etiquette, red/white framed "First Air Mail from/ Trinidad via Nyrbaline" vignette. 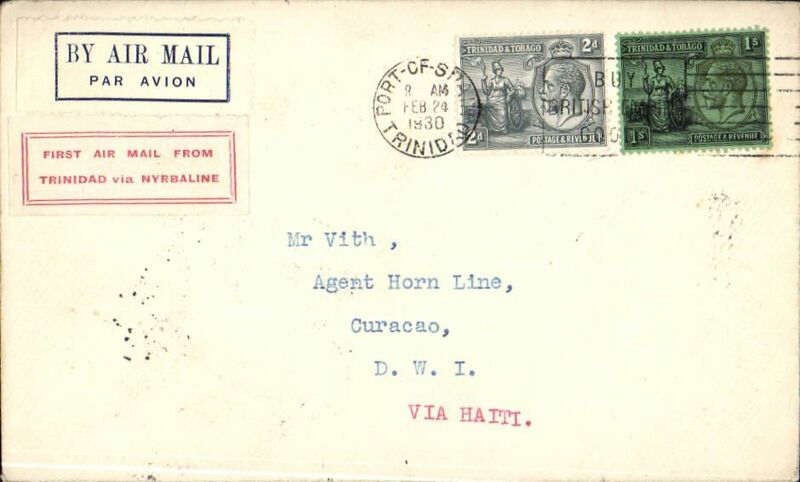 F/F Port of Spain to St Georges, Grenada, bs 20/7, blue/white rated very scarce by Mair, NYRBA. 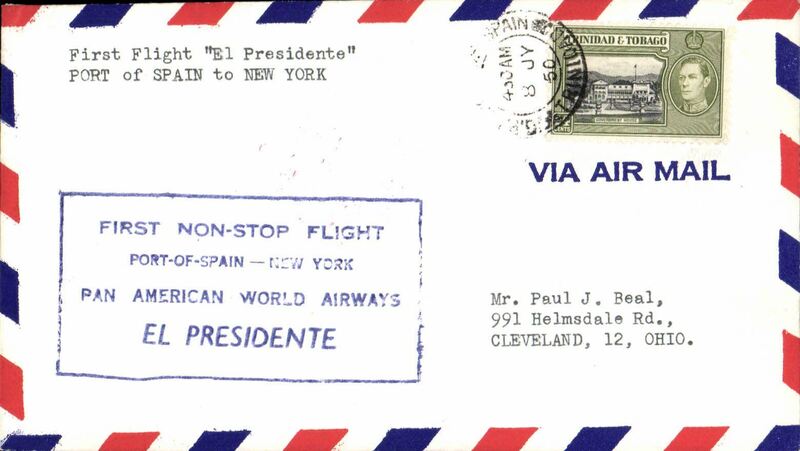 The last inaugural flight by NYRBA before the West Indies contract ws lost to Pan Am. Francis Field authentication hs verso. 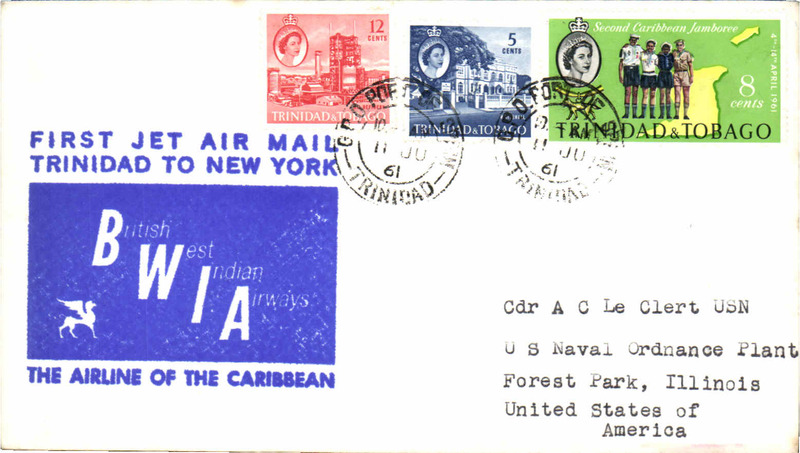 Very scarce F/F FAM 5 Port of Spain to Kingston, Jamaica, bs 7/1, via Miami, plain cover franked 11d, dark blue/white airmail etiquette, Pan Am. Ref Locke JM, 1962. 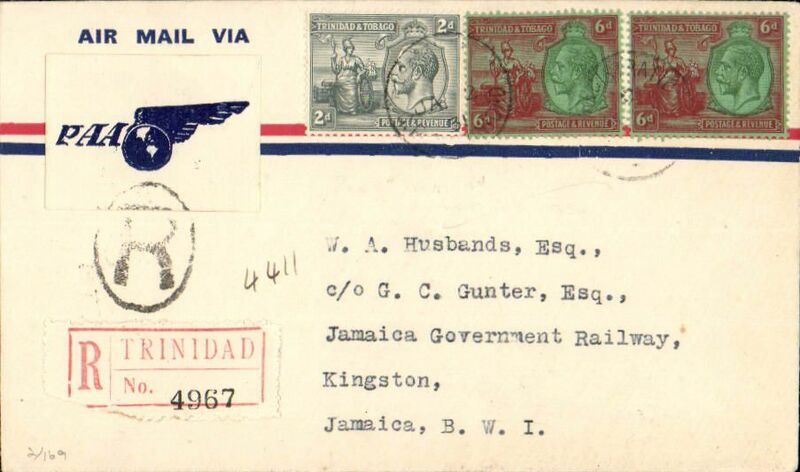 On Jan 9, 1931 Kingston replaced Ceinfuegos as the express service overnight stop - AAMC III 2004, p52. 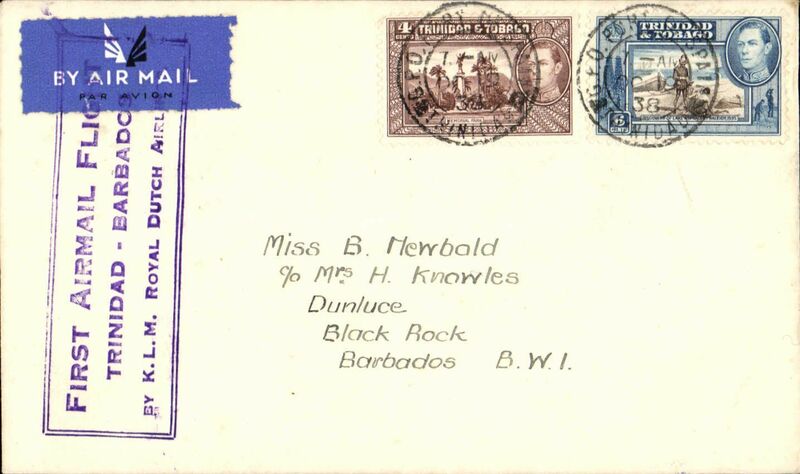 SCARCE F/F FAM 5 Port of Spain to Kingston, Jamaica, bs 7/1, via Miami, registered (label) cover franked 11d, black 'R' in oval tying blue/white winged 'PAA' vignette, Pan Am. Ref Locke JM, 1962. 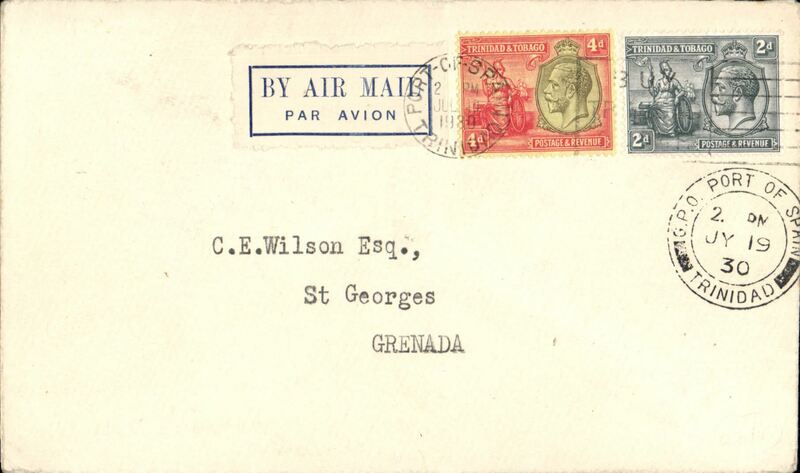 On Jan 9, 1931 Kingston replaced Ceinfuegos as the express service overnight stop - AAMC III 2004, p52. 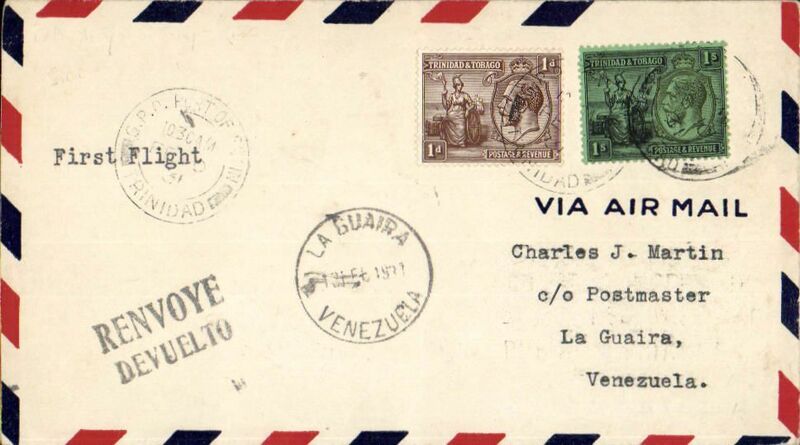 Compagnie Gיnיrale Aיropostale F/F Port-of-Spain (Trinidad) to Caracas (Venezuela) via Ciudad Bolםvar, no arrival b/s (as is often the case), imprint etiquette airmail cover franked 1/-, 1d KGV stamps, canc Port-of-Spain cds. First flight by famous Aeropostale pilot Paul Vachet on a Late 28. 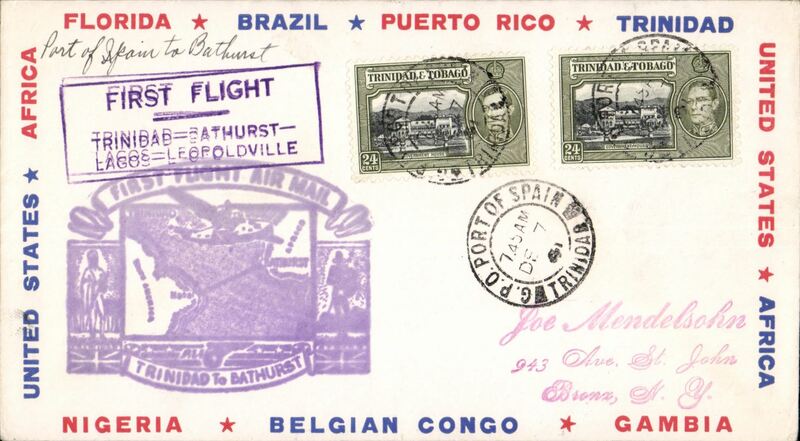 There were 500 covers on board the flight, only 150 addressed to Caracas, see Collot and Cornu, Ligne Mermoz. pp166 & Muller #30. 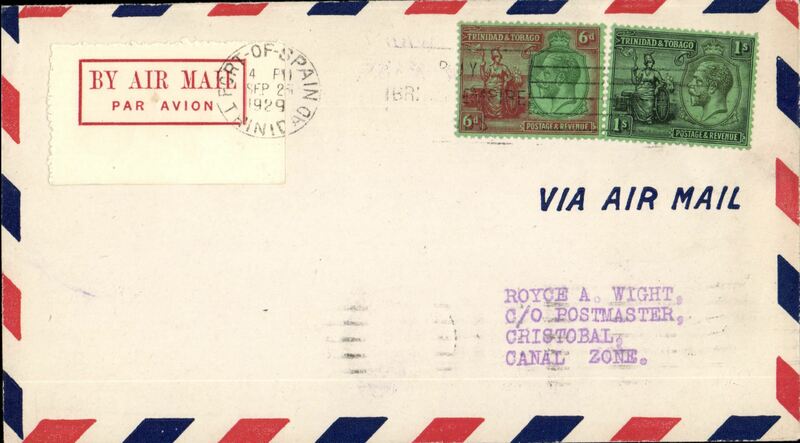 Completing the Lindberg Circle, F/F FAM 5, Port of Spain to La Guaira, Venezuela, 13/2 arrival ds on front, airmail cover franked 1/1d, Pan Am. 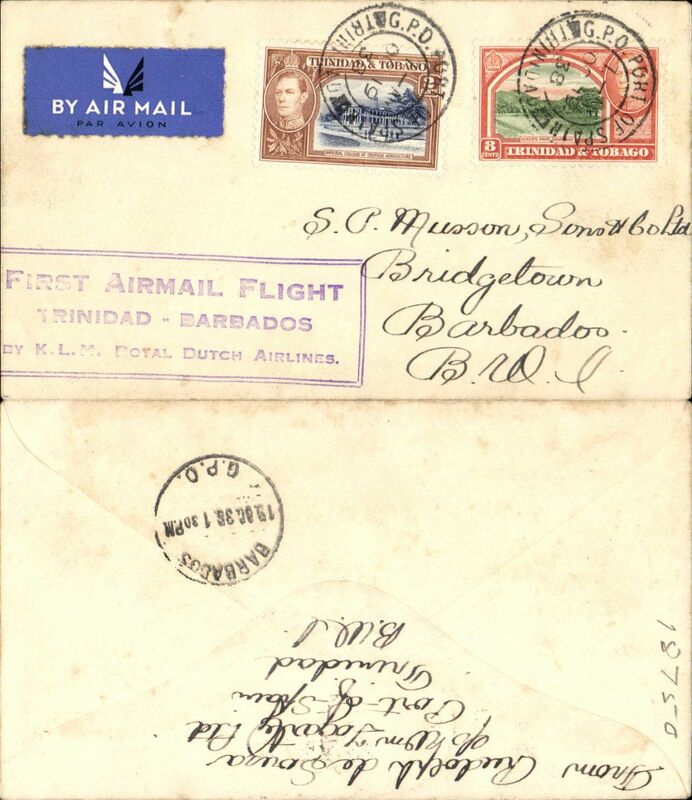 KLM, F/F Port of Spain to Barbados, framed flight cachet, b/s 19/10, plain cover franked 10c. 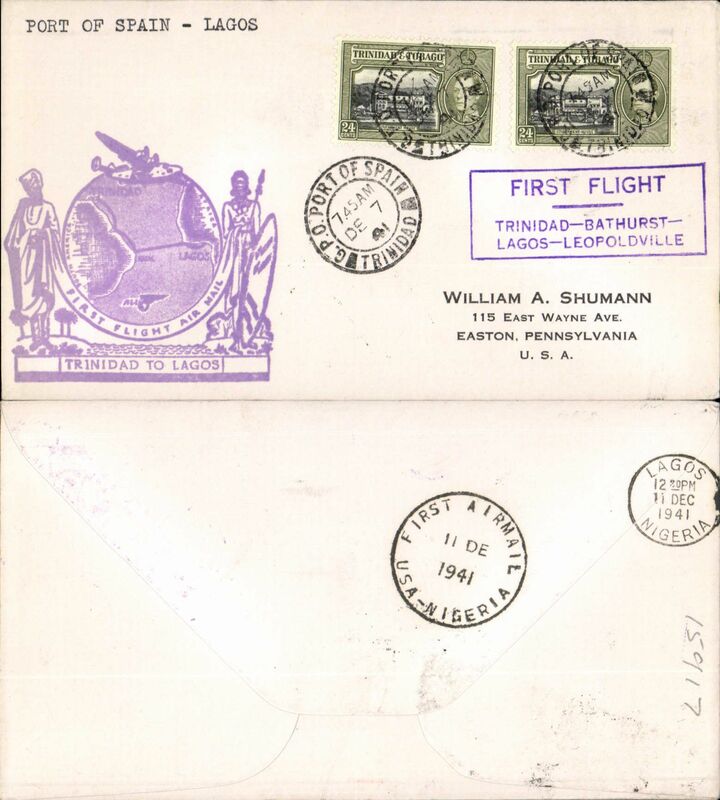 Pan Am FAM 22, F/F Port of Spain to Lagos, bs 11/12 circular 'First Airmail/USA-Nigeria/11 DE 1941' special ds, large violet 'Trinidad to Lagos' cachet and rectangular flight cachet on font, plain cover franked 2x 24c. 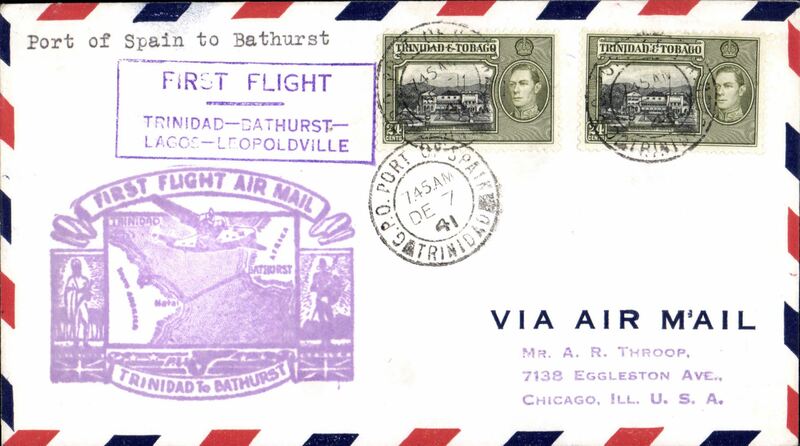 Pan Am clipper service to Africa, F/F FAM 22, Port of Spain to Bathurst, large purple cachet, b/s. This srategically important service, linking Africa and the USA, opened just at the critical time when Japan attacked Pearl Harbour and the USA went to war. 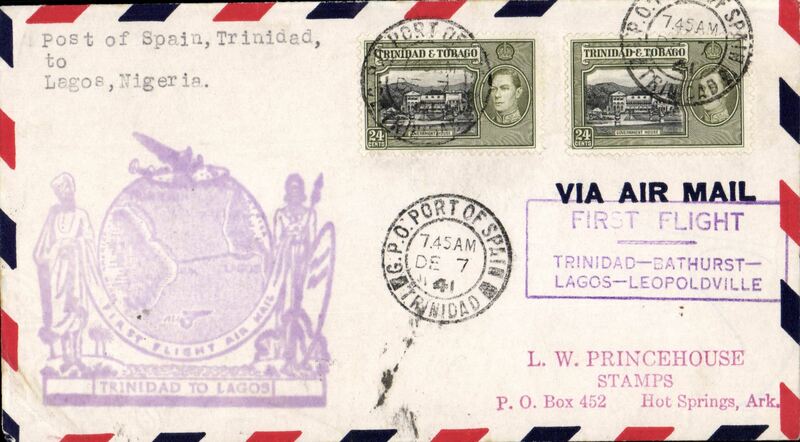 Pan Am clipper service to Africa, F/F FAM 22, Port of Spain to Lagos, large purple cachet, b/s. This srategically important service, linking Africa and the USA, opened just at the critical time when Japan attacked Pearl Harbour and the USA went to war. 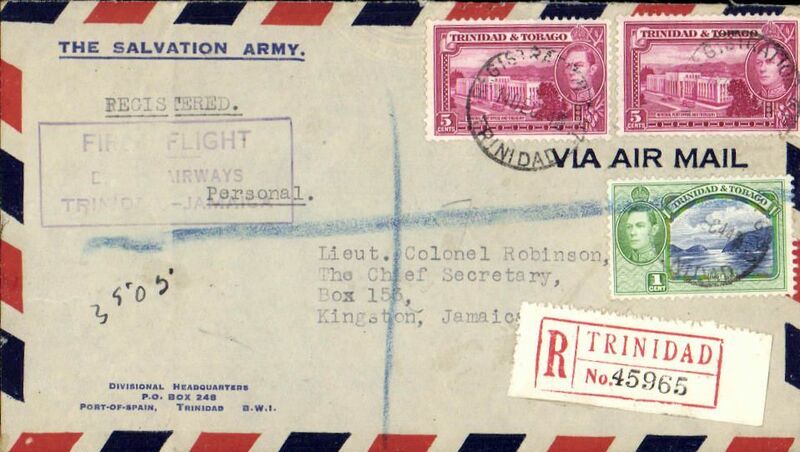 WWII uncensored US Military mail,Trinidad to England, no arrival ds, airmail cover, 23x11cm, franked red 272c/Pointe a Pierre/12.1.42 metre postmark, violet 'Private' hs and violet two line 'To New York By Air/and Onward by Air' hs's front and verso, typed 'Transatlantic Airmail' and 'Staff, Private Staff/ & Private Market Mail/PTH. 188'. 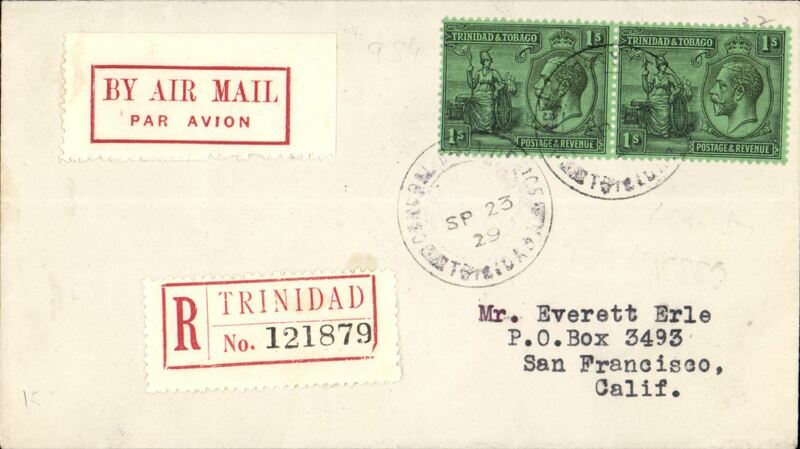 Mail carried by US military aircraft, or under contract to the US military was not censored. Pointe-א-Pierre is a the site of the country's largest oil refinery. Nice WWI item. 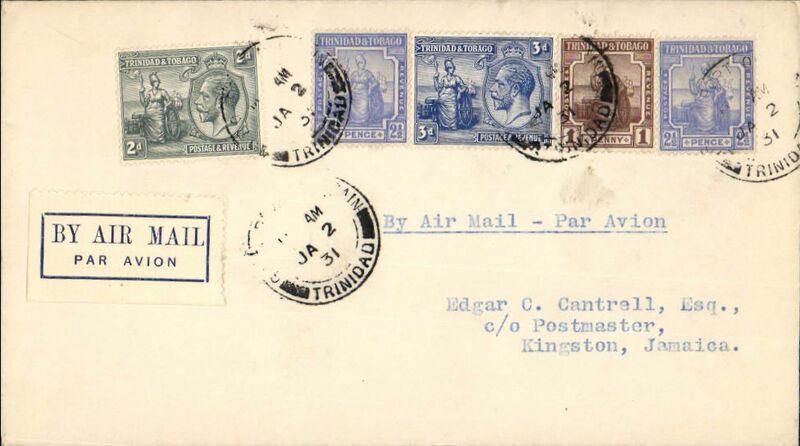 British West Indian Airways F/F Port of Spain to Kingston, Jamaica, partial strike red circular Kingston/TRI arrival mark verso, registered (label) Salvation Army airmail cover franked 7c, blue framed "First Flight BWI Airways/Trinidad-Jamaica. Not often seen. BWIA, first jet New York to Port of Spain, cachet, b/s. 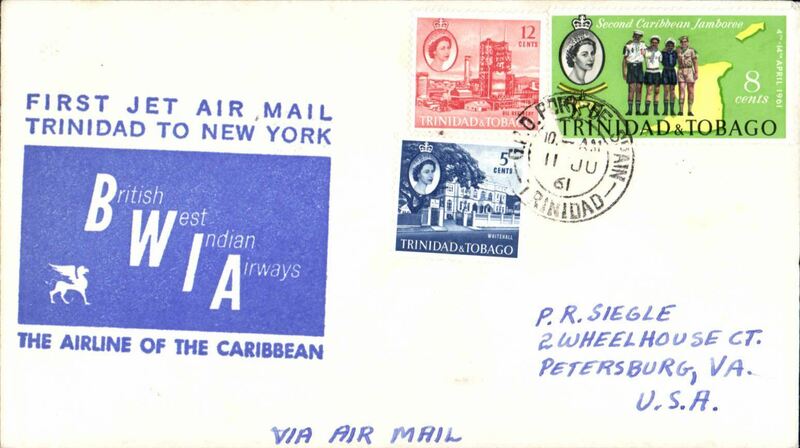 BWIA, F/F Trinidad to New York, bs 11/6, plain cover franked 25c, large blue flight cachet. 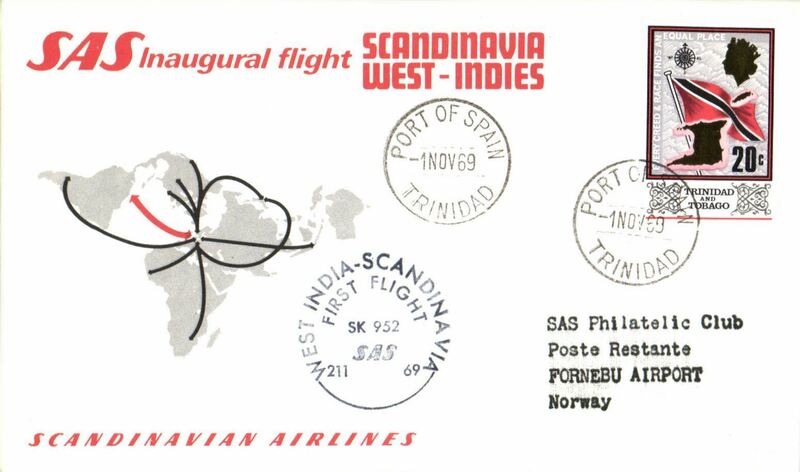 SAS Inaugural Scandinavia-West Indies service, F/F Port of Spain-Oslo, cachet, b/s, souvenir card.